Who is Diana you may ask? Diana is the RIT Hot Wheelz car. Sarah Burke, one of our Career Services Coordinators, is a very busy lady. Outside of the work she does for our office and her students, Sarah serves as the advisor for the Hot Wheelz team. The Hot Wheelz team is made up of 50 female students from multiple different year levels and different programs. 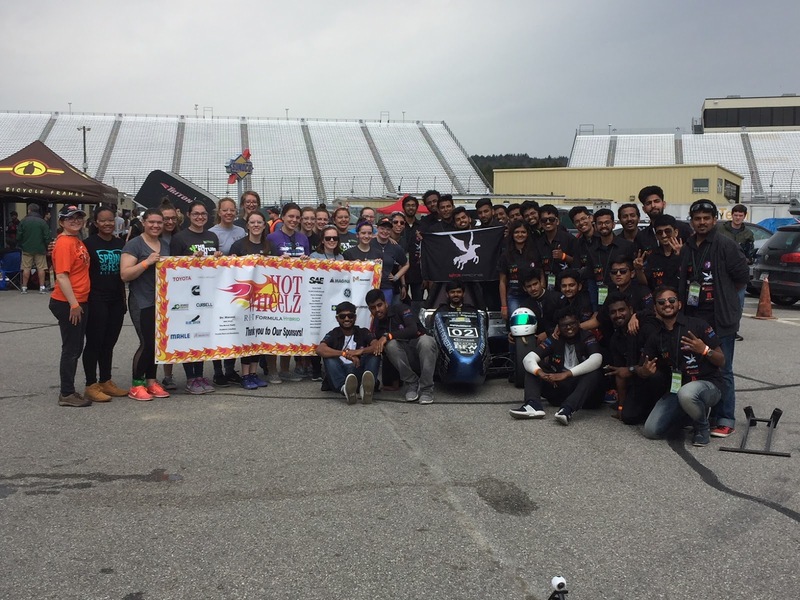 This week Sarah and 20 team members traveled to New Hampshire to represent RIT Hot Wheelz at the Formula Hybrid Competition. Braving rain and cold temperature, Diana has made it through Pre-Tech and Mechanical Inspection thus far! Diana is proudly wearing the “Passing” sticker on her hood (pictured). Tuesday afternoon was the Electrical Technical Inspection. This review took over 2 hours; two judges - a GM Engineer and head judge from BAE- look at and check every individual electrical connection. The judges found only 4 small things that need to be fixed. Thursday brought new friends. The Hot Wheelz team befriended a team from RV College of Engineering in India (pictured). Thursday also brought along rain – in more ways than one. Diana needed to pass the Rain Test to move further along in the competition. For the Rain Test, Diana needed to sit under a sprinkler for 5 minutes, during which time nothing on the vehicle could fault. Ironically, it started raining about the same time Diana went under the sprinkler. 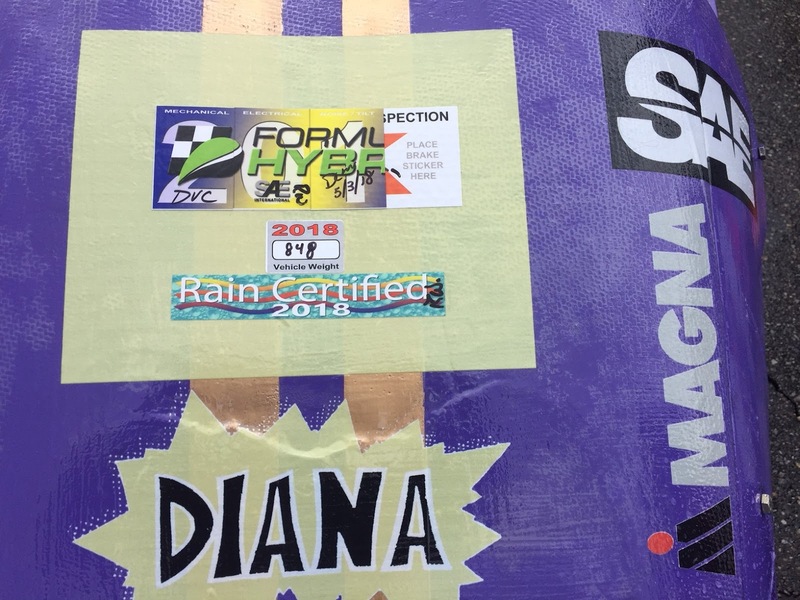 After sitting under the sprinkler (and rain) for about 4 minutes, Diana passed, and is proudly wearing the “Rain Certified” sticker! 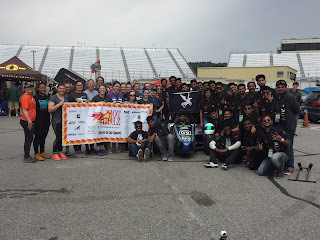 The Hot Wheelz team and the RV College of Engineering Ashwa RacingTeam. Diana wearing many of her passing stickers! Diana will then be put through the Tilt Test – where they put the car on a lift that literally lifts it and tilts to about a 70-degree angle- then Noise Test, and finally Brake Test. Sarah and the team feel confident on all of them but brakes – still having brake, steering and controller issues but they are working hard to fix those issues. Both Sarah and the Hot Wheelz team are hard at work outside of the garage, too. In the midst of finals week, the team spends their evenings in the lobby working on papers, projects, and final exams. Several team members were even able to squeeze in interviews this week. Sarah has been busy connecting with alumni who have come to the competition to now judge the cars (pictured). Sarah has also had time to meet with company representatives at GM, Ford, FCA (Chrysler) LG Chem, and BAE – all sponsors of the competition. 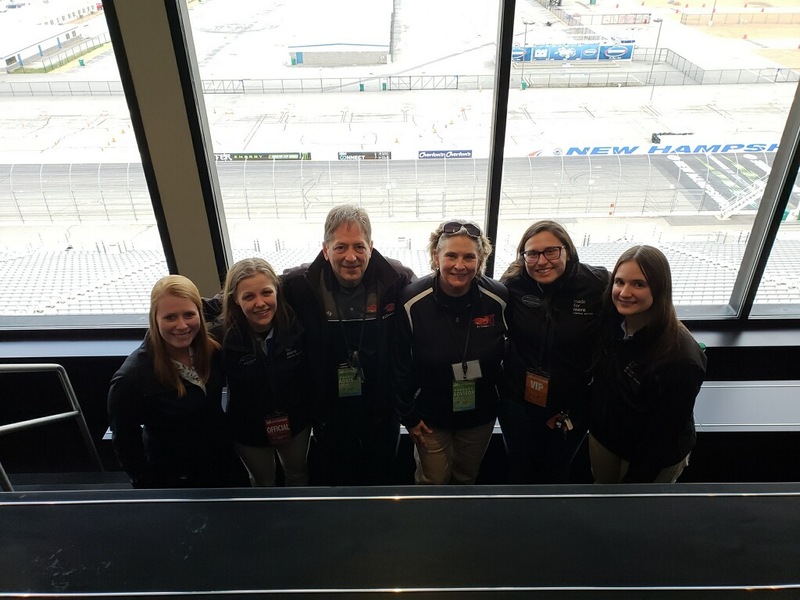 L to R – Jennifer Smith ‘16/ME/Keurig, Missy Miller ‘17/IE/GM, Marty Schooping from GIS/CIMS, Sarah Burke, RIT Career Services, Maura Chmielowiec ‘16/ME/GM and Caitlin Babul ‘17/ME/GM. Sarah has been missed this week by our office and students, but the Engineering team has been a great backup to Sarah, ensuring her students are well taken care of while she in New Hampshire with Hot Wheelz. At the close of the competition, Diana came in 3rd overall! We are so proud of the team and so happy Sarah was able to be there supporting them! Tips to Prepare for the Career Fair!